From actress to author, the glamorous Twinkle Khanna tells Ronjita Kulkarni/ Rediff.com who she really is. Twinkle Khanna has just got a new identity. The actress, who made her acting debut with the cringe-worthy Barsaat in 1995, and went on to act in even more cringe-worthy movies, is now better known for her fascinating talent with words. Her columns in the DNA newspaper are elegantly witty, as she takes on current topics and gives them her spin. So a column on the Maggi ban had her writing about a certain gentlemen, who was a two-minute noodle in the bedroom! "My frankness has got me into a lot of trouble," Twinkle says with a laugh. "I try to temper it down now. As you get older, you get wiser. Earlier, I used to say things foolishly. Once, I went to the premiere of a film, and the producer asked me if I liked it. I said it's crap. But I don't say that anymore. Now I say I have to think about it. If you ever hear me say that, you know the answer!" "There was another time when I went to this party and met this legendary movie star. I was trying to pay her a compliment, so I said: 'You look so young, how do you do it? Do you sleep with your head hanging out off your bed?' She gave me such a look! And I was trying to be nice!" Yes, there is a lot of wit in that girl. Twinkle's newly released book Mrs Funnybones peeks into her life and shows us a woman, who's Just Like You And A Lot Like Me. Or that's what the tagline says. But is she really just like me? "I'm just a normal girl," Twinkle replies. "People have these preconceived notions about what movie stars are about, and how we've grown up. My mother is pretty regular and raised us just like anyone else. I went to boarding school (the New Era High School, Panchgani), where you're treated as no one. There weren't many Indians there, and I wasn't treated extra special." The 'normal girl,' born of superstar parents Rajesh Khanna and Dimple Kapadia, became a movie star, married one of Bollywood's top stars, and currently lives in a gorgeous sea-facing home, in Mumbai's home of the stars area, Juhu. IMAGE: Twinkle Khanna and Shah Rukh Khan in Badshah. But Twinkle never liked being a movie star. "I pretend that I was never in the movies," Twinkle says, quite seriously. "The only job I had before was selling prawns door to door. That's what I tell myself. My kids have never seen my films. I'm too embarrassed to show them. I laugh at them. When they come on television, my husband (the 'Man of the House,' as she describes Akshay Kumar) calls me over for a laugh but I just switch off the TV and run out of the room." Twinkle is not proud of the brilliant cult-worthy Badshah either, co-starring Shah Rukh Khan. "I've never seen the whole film," she claims. "I cringe at my films! I cover my head under a blanket!" she exclaims. "People have certain skills and I think acting was not one of mine. That's not what I set out to do in life anyway." Twinkle, apparently, wanted to become a CA. "My mother and accountant also felt that way," she reasons. After finishing her Class 12, Twinkle gave her CA entrance exam. But she joined the movies within six months, so she couldn't pursue an accountant's life. "I don't miss acting at all," Twinkle adds. "I found the waiting very boring. You have to wait for hours because they have to set up the next shot, light it up... There were no phones, mobiles, or I-Pads in those days. And there were no women on the sets either!" "My objectivity towards him is slanted because I know him too well as a person. The portions with the kid (in Brothers), that's exactly how he talks to our daughter," Twinkle says. Which of his movies does she dislike? "And do I want to continue staying in this house?" she asks. Did Akshay fall in love with her sense of humour? "I doubt that very much," Twinkle laughs. "But I don't ask him such questions." But Akshay, clearly, is more emotional than his wife. "He cries a lot more than I do," she confides. "He even cried during a film in which Arnold Schwarzenegger's daughter becomes a zombie!" 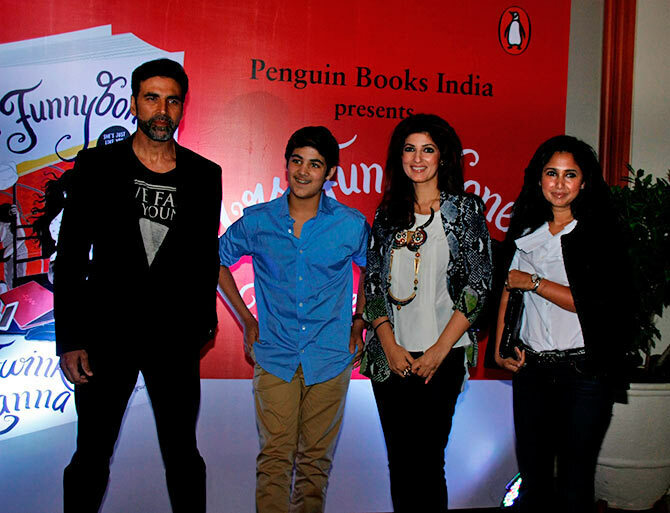 IMAGE: Twinkle Khanna with husband Akshay Kumar, son Aarav and sister Rinke Khanna at her book launch in Mumbai. Mrs Funnybones is taken from Twinkle's life by about 70 percent. "The book is about how the modern Indian woman lives in this country. She has access to the Internet but is still tied to traditional things like fasting on Karva Chauth and tying a black thread around her child's hand. The book is uniquely an Indian point of view, what it's like to be a woman living in India and deal with the irony." She titled the book after her Twitter handle, Mrs Funnybones. "I came to Twitter very late. My husband told me that we don't want a morcha outside our house, so kindly refrain. I thought I'll go anonymously on Twitter and have fun, so my handle was Mrs Funnybones. When I decided to finally go official, my name was already taken. I could either be 'The One and Only Twinkle Khanna' or 'The Twinkle Khanna'. So I just stuck with Mrs Funnybones. It fit in very well with my sense of humour and every single bone in my body." She took a year to write the book. "My kids go off to school by 7 am. I have the house to myself for an hour, and that's when I try to write," she says. Her mother Dimple is obviously thrilled with her book. "When I asked my mother if she'd read the book, she said she was going to the temple to pick it up, as she had kept the book there. I asked her why she'd kept the book in the temple! Was God going to read the book because he had nothing to do? But when she got it back, she stayed up till 2 am and read the book at one go. I think in her heart she's shocked because she always thinks my sister is better at everything than I am. She can't believe that I've done this," Twinkle says. The book, like her columns, also introduces us to Twinkle's elaborate menu from time to time, like avocado appetizers and mango parfaits. Are her daily meals really that fancy? "Not at all! I had lunch in office today, in a little plastic dabba. It was salad with chicken. My dinner is one bajra roti, dal and a subzi," she tells me, adding mischievously, "After all, I'm just like you!" The fit and fabulous life of Akshay Kumar!